Published: Nov. 25, 2018 at 01:44 p.m.
New York Jets quarterback Josh McCown hits wide receiver Jermaine Kearse for a 16-yard touchdown catch. 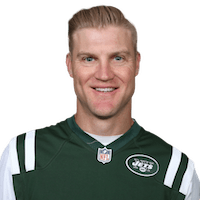 Published: Dec. 3, 2017 at 04:25 p.m.
New York Jets quarterback Josh McCown punches it in for a quick 1-yard touchdown. Published: Dec. 3, 2017 at 04:06 p.m.
New York Jets quarterback Josh McCown throws it to wide receiver Jermaine Kearse, who breaks loose for 51 yards. Published: Dec. 3, 2017 at 03:46 p.m.
New York Jets wide receiver Jermaine Kearse makes a phenomenal effort to bring in a one-handed catch for the first down.